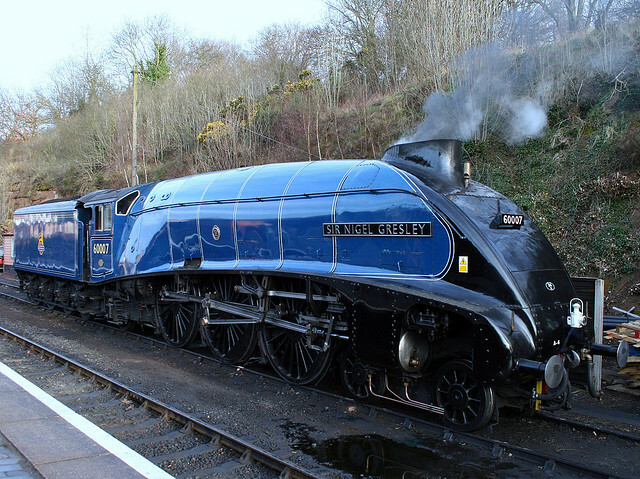 Having seen loads of awesome Gresley designed A4 Pacific steam locomotives down at the Severn Valley Railway over the years, like Bittern, Union of South Africa and Sir Nigel Gresley, I thought I would commemorate Sir Nigel Gresley who was Born 19 June 1876 and became one of Britain’s most famous steam locomotive engineers. He rose to become Chief Mechanical Engineer (CME) of the London and North Eastern Railway (LNER) and was the designer of some of the most famous steam locomotives in Britain, including the LNER Class A1, A3 and LNER Class A4 4-6-2 Pacific engines. 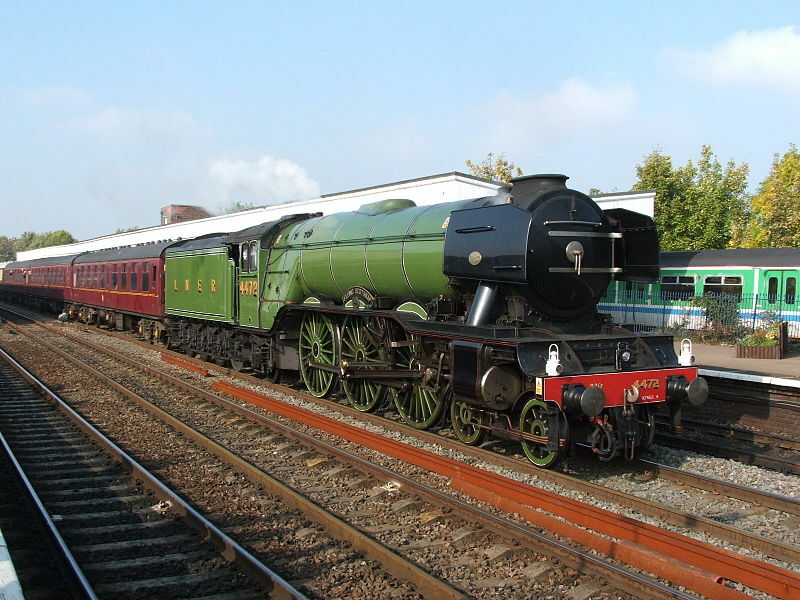 An A3, Flying Scotsman, was the first steam locomotive officially recorded over 100 mph in passenger service, and an A4, number 4468 Mallard, still holds the record for being the fastest steam locomotive in the world (126 mph). Gresley’s engines were considered elegant, both aesthetically and mechanically. His invention of a three-cylinder design with only two sets of Walschaerts valve gear, together with conjugated valve gear, produced smooth running and power at lower cost than would have been achieved with a more conventional three sets of Walschaerts gear. The band were also early innovators with video technology in their live stadium shows. The group was formed by Nick Rhodes, John Taylor and Stephen Duffy, with the later addition of Roger Taylor and, after numerous personnel changes, Andy Taylor and Simon Le Bon. (None of the Taylors are related, and Roger Taylor is not to be confused with the Queen drummer of the same name.) The group has never disbanded, but the line-up has changed to include guitarist Warren Cuccurullo from 1989 to 2001 and drummer Sterling Campbell from 1989 to 1991. The reunion of the original five members in the early 2000s created a stir among the band’s fans and music media. However Andy Taylor left the band in mid-2006, and London guitarist Dom Brown has since been working with the band as a session player and touring member. American singer-songwriter, musician, record producer and actor Lionel Richie was born this date June 20, 1949 in Tuskegee, Alabama. From 1968, he was a member of the musical group Commodores signed to Motown Records. Richie made his solo debut in 1982 with the album Lionel Richie and number-one hit “Truly”.As a student in Tuskegee, Richie formed a succession of R&B groups in the mid-1960s. In 1968 he became a singer and saxophonist with the Commodores. On December 9, 2006, Richie hosted and performed live on the British television show An Audience with Lionel Richie. Two months later, he performed “Hello” on the 49th Grammy Awards show. On November 25, 2007, he made a surprise appearance on the Australian Idol grand finale performing “All Night Long (All Night)” at the Sydney Opera House. Richie donated to Barack Obama’s 2008 Presidential campaign. On May 2, 2008, he became the 21st recipient of the George and Ira Gershwin Lifetime Achievement Award at UCLA’s annual Spring Sing and Recently, he announced that he would like to get The Commodores back together soon, “or in the next 10 years no one will care.” On December 31, 2008, Richie performed in Times Square for the New Year’s Eve celebration and ball drop. He also performed on the 2009 season finale for American Idol with Danny Gokey. On July 7, 2009, Richie performed “Jesus is Love” at Michael Jackson’s memorial service and A new album, Just Go was released in spring 2009 – around the time Lionel confirmed there is to be a Commodores reunion in the near future. Each year, UNHCR announces a theme for its World Refugee Day campaign. Recent themes include: one family torn apart by war is too many, 1 refugee forced to flee is too many, Home and Protection. Individuals and community groups are encouraged to mark the day by attending a local World Refugee Day event, watching and sharing World Refugee Day videos, and raising awareness for refugees on social media.